Enriched with vast domain experience, we offer appealing range of Conference Chair that is treasured for designer looks and quality finishing. Offered range is delivering with multiple compartments and is extremely spacious in nature. Our entire range is trendy in nature and ensures stylish appearance. Our Office Chair have classic designs and perfect for all types of organizations. With wheels attached, these chairs are ideal for working on in the workstations and moving about easily. These chairs are spacious and have comfortable hand rests along with reclining back rests. The height of these chairs can be adjusted easily as per the requirement of the users. 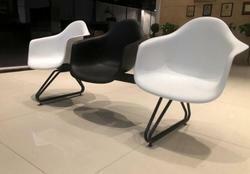 We are engaged in providing our clients with Combine Chair that are available in various designs and color combination. Our chairs are best suited for the people, who sit for long hours in the same position. We are looking queries for Delhi/NCR region. Visitor mesh chair with fixed handles and chrome finished based options: PP/ Nylon/ Chrome base. 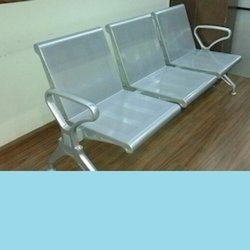 Made from Stainless Steel 304 grade, these visitor chairs are ideal for offices, ships, as they are non corrosive, they are available in High back, medium back. Twenty First Century Techno Products Pvt. Ltd.
We source and inspect all types of antiqued, nickle, brass, copper etc plated iron stuffs, all types of Industrial furniture and gift wares. Our firm have gained proficiency in providing a broad range of Executive Chair (GV-233) to our consumers. These are broadly used in numerous sectors. Our chairs are highly admired for their quality and longer life. These are easily attainable at a very economical market prices.